“Sen. 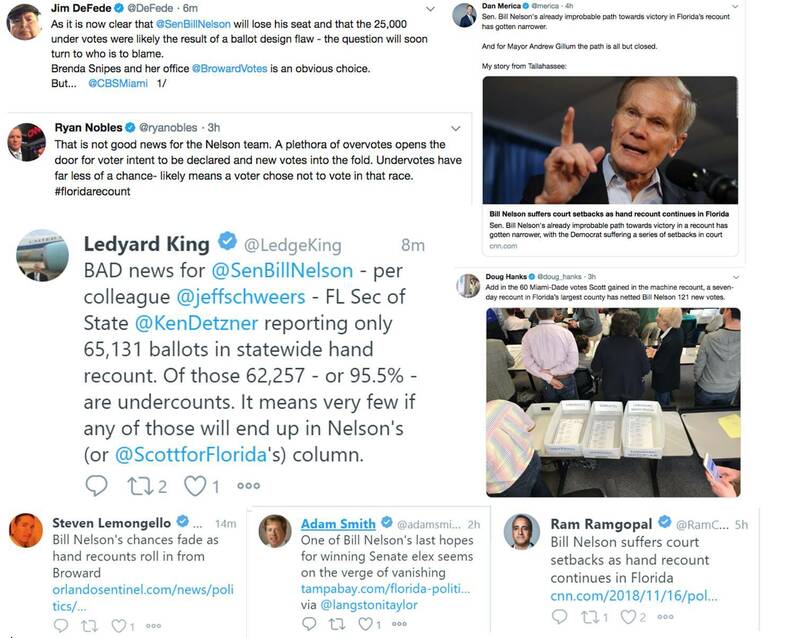 Bill Nelson has run out of time, run out of favorable court rulings and is about to officially run out of votes. As of this morning, almost all the overvotes and undervotes have been recounted across the state, including in Orange, Miami-Dade, Alachua, Palm Beach and Broward Counties. As we reported last night, pursuant to a public records request from our campaign, the Broward County Supervisor of Elections provided the results from their manual recount. While almost 1/3rd of undervotes in the state were in Broward County (31,000) there were only 500 new ballots counted, netting Bill Nelson less than 300 votes.